photo tips and personal photography work. Sometimes it's the littlest details that can bring you back to a moment in time. When you are a storytelling photographer, it is important to photograph your subject from all angles. This month for the "In These Moments" monthly blog circle, we are showcasing details. I have chosen to highlight my "Scary Halloween Porch." I say that with quotes because my daughters really wanted to make our porch scary, but I like it to have mums and pumpkins and look, "pretty." This year I let them do basically whatever they wanted with some things that they picked up at the dollar store with their grandmother. I don't think it was the scariest house on the block, but I think they did a great job (especially with those spider webs that I am terrible at putting out). Personally, I think the creepiest things are the hanging skeletons. Scroll down and see how they did. Documentary photos of everyday moments are a great way to share your lives with far away family. My mom helped my kids pick out many of the decorations when she visited in August. She really wanted to see the end result but doesn't live nearby. I promised her I would send her some pictures of what they had done. That is the great thing about photographs - documentary/storytelling ones specifically - they are great for sharing your life with your family when they live far away. My children have never (until very recently) lived near anyone in their family. My photos of them and our life have been the best way to share our daily life with my parents, my in-laws, aunts, uncles, etc. 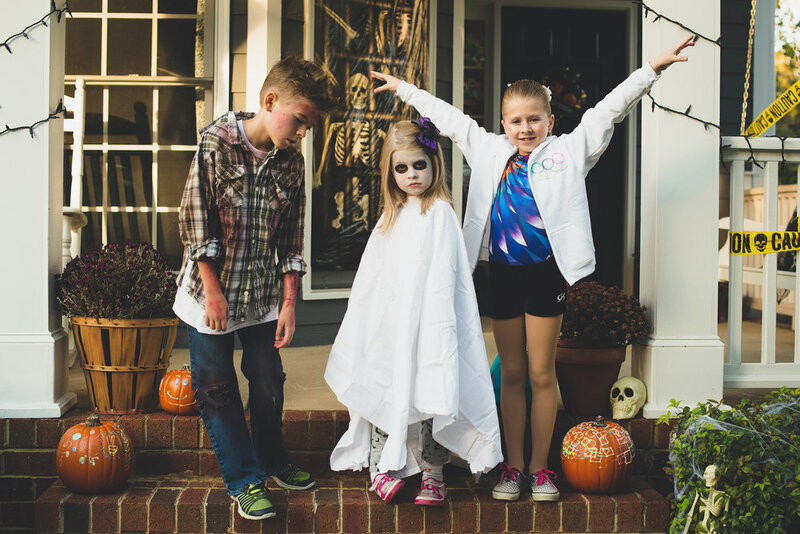 Here are some images of them on the porch in this year's costumes. You've probably noticed that I didn't include any candid images of the girls actually decorating. Here is a little secret about me - yes, I love to photograph the kids doing everyday things. Sometimes, like every other mom I know, when my kids get busy and involved in an activity that doesn't require my help, I take a few minutes of "me" time to read, rest, watch tv, play solitaire ... you get the idea OR I do things around the house like, cooking, laundry, cleaning, etc. Sometimes, I just don't feel like taking out my camera and sometimes I don't get the shots. And when that happens - I give myself grace (as all mother's should!). For this particular story of "Halloween 2016" I have these detail shots, I have my yearly pumpkin patch images, I have pictures of them carving their pumpkins and I have their Halloween costume pics. And that is more than enough for me. Cheers! Please click here to see Mia Lynn Photography's post, "It's In The Details." As a documentary family photography (and family historian extraordinaire), I take pictures as often as I can of my children and family. One thing that I have learned in all this documenting is that you never know when it's going to be the last time that you (or your children) do something. You never know when it will be the last time that your child crawls, the last time that you carry your child up to their bed because they fell asleep during movie night next to you on the couch, the last time that she screams, "airplane!" with delight as she looks up to the sky at the passing plane. I don't mean this in a morbid way, although it holds true for that, too. I notice all the time, especially now that my children are out of the baby and preschool days, that they just don't do certain things anymore. Things that I loved and things that I remember fondly - from small gestures to some of the bigger things that I mentioned above. It's so important to document the big things and the little things while you can. 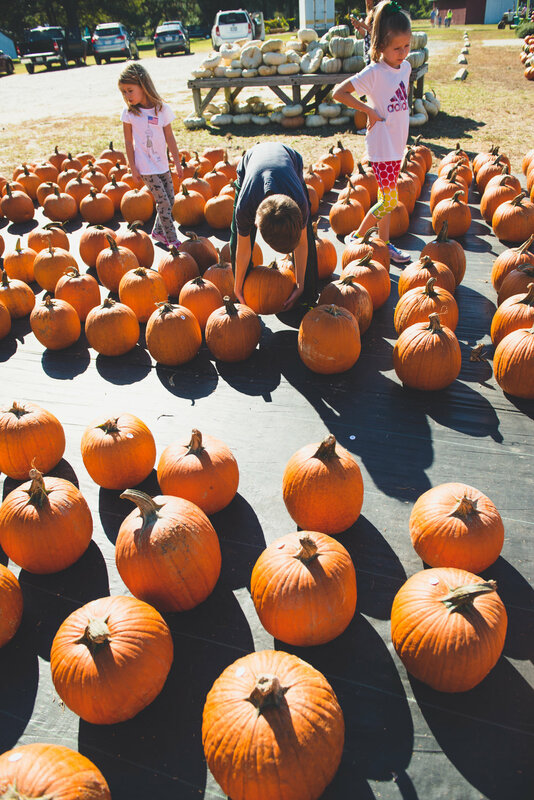 We have a family tradition of picking pumpkins together at a local pumpkin patch or farm stand every fall. We don't always go to the corn mazes or play at the farms with tons of activities, but we always go out for pumpkins. When the kids were little, I would buy them a cute Halloween shirt for them to wear throughout the fall season, but let's be honest it was mostly to wear for this traditional trip out for pumpkins. It was a gorgeous weekend in the Triangle. Perfect for a family trip to the pumpkin patch. We were headed to Hill Ridge Farms, but because of a couple bad accidents and some major traffic on Capital Boulevard we never made it. To say I was disappointed is an understatement. It took a lot of effort to get my oldest child on board with going in the first place. He protested from the start and was absolutely against coming with us. As he is only 11, he really didn't have a choice, though. It was battle we had won, for now. (I didn't even attempt to get anyone to wear any special shirts - I don't even buy them anymore.) We all piled into the car, my camera in tow and set off for the 45 minute drive. We got about half way there and then we sat and sat and sat some more in traffic. It. was. miserable. Even if we could've gotten through the traffic, we didn't have enough time at this point to stay and enjoy it. We ended up heading back to Cary, stopping at DJ's Berry Patch for our pumpkins. We didn't have much time so it was a super quick visit. Like - SUPER quick. It was the fastest pumpkin picking we've ever done, actually. They had a nice selection of pumpkins and it was fine, but it wasn't necessarily exciting for anyone - even my youngest. 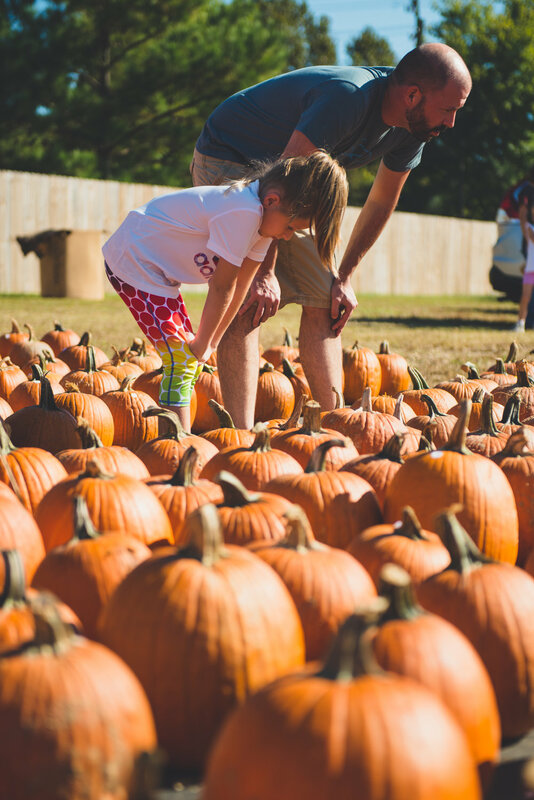 I documented with candid images because in the end, it was our yearly trip to get pumpkins. Here are most of what I took that afternoon. Scroll through - I wonder if anyone can spot me in an image. You have to think abstractly to find me. While my kids were picking out their pumpkins, I saw the sweetest toddler running up and down the rows of pumpkins. He had the biggest smile on his face. I was sad thinking about how our experience with this tradition was now different and this particular activity would forever be different. 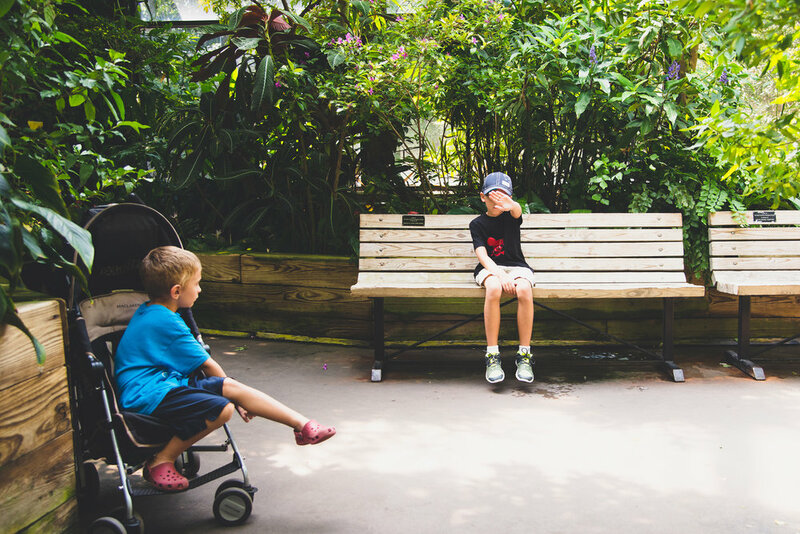 This little boy prompted me to think about when my kids were toddlers. I usually had my camera with me, but I was always chasing them down the rows. I wasn't in front of them, able to enjoy (or photograph) their smiles and giggles as they explored this once a year experience. Many of our outings and experiences were and are now a blur. I wish that I had someone there to tell that story for me. This is why I love being a documentary photographer for families. My goal is to take the pressure off of parents and tell the story for you with candid, raw images and portraits of your children. And here is the obligatory family photo. There are so many things wrong with this photo, but at the same time it really captured that afternoon. I created "Fall Outings" sessions because I love documenting families in their homes and I also love to tell the stories of being out together as a family in a favorite place. I know that as they grow my children will have new experiences that will also elicit smiles and laughs (even from my tween). They are just different at each age. For us no one was running around, smiling at all the pumpkins, but here are some things that I did notice about them. My son was very helpful in how he helped his little sister carry her pumpkin and how he helped me carry the mums to our car. My daughter was analytical in deciding which pumpkin would be best to carve her jack-o-lantern, almost always at her father's side. My littlest love still stays close, adores us and wants to hold our hands. She wasn't running around but still found things to interest her and make her smile. Oh, and apparently, occasionally, they work well under pressure because we were in and out in about 10 minutes - a record trip! I intend to keep photographing them and our family adventures. As much as I long for the days of my kids being excited about simple things, I look forward to the unknown firsts and lasts that lay ahead for me and my family. 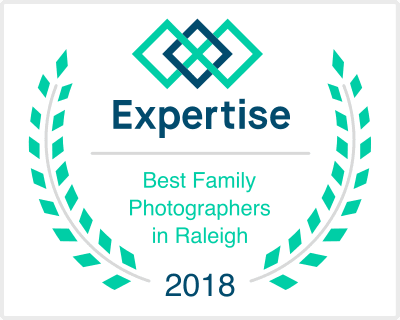 If you want to document a special activity or tradition of your family, contact Laura Ann Photography today to schedule your in-home documentary or fall outing session. I can't wait to tell your story! 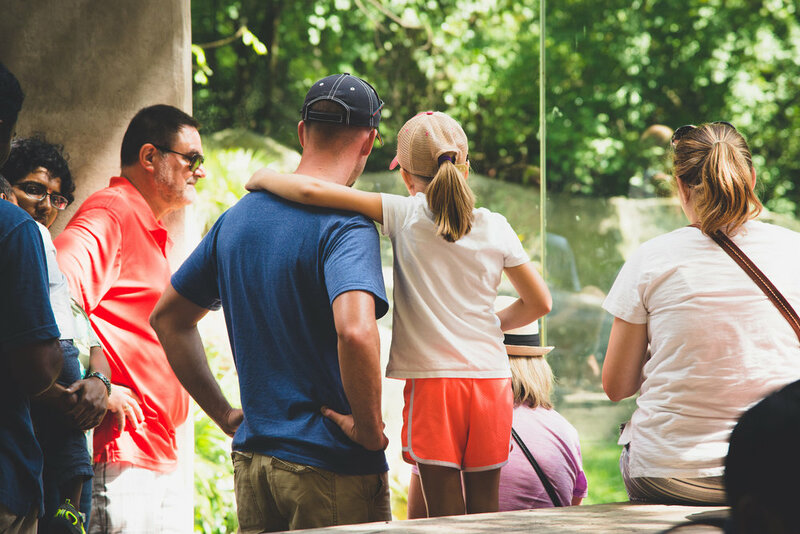 I enjoyed photographing my family during a day trip to the North Carolina Zoo in Asheboro, NC. 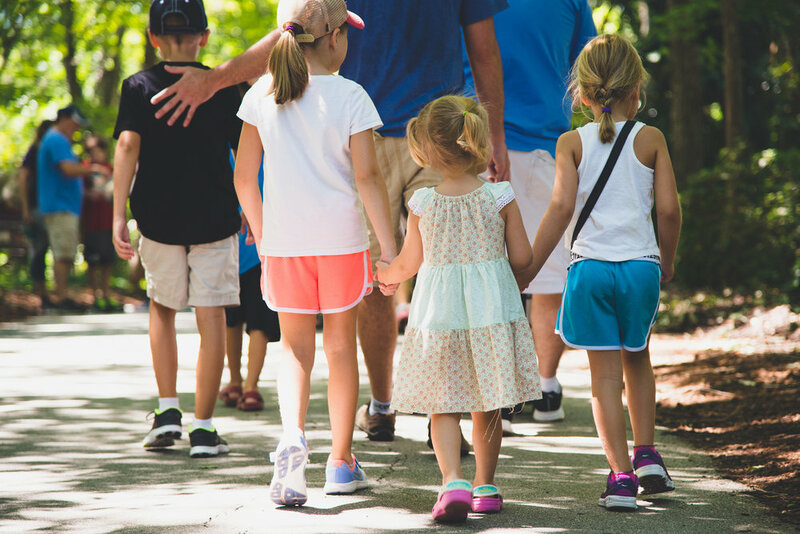 We love the NC Zoo. Every few years, we purchase a family membership and then we visit a bunch of times that year to make it worthwhile. Then we take a year or two off. If you live in North Carolina and you haven't been, you really need to check it out. 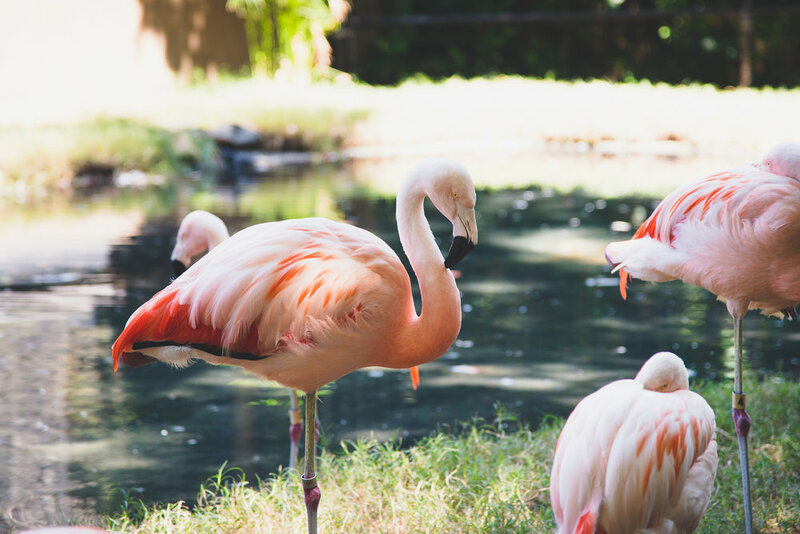 It is a fantastic zoo. We haven't been in over a year and my sister and her family recently moved down here to NC so we invited them to come with us. We usually pick a section to visit each time (there are two: Africa & North America) and spend our day in only that section. It really is that big! We ended up picking a great day to go. The weather was predicted to be beautiful and it did not disappoint. We chose to spend this visit in the "Africa" section. 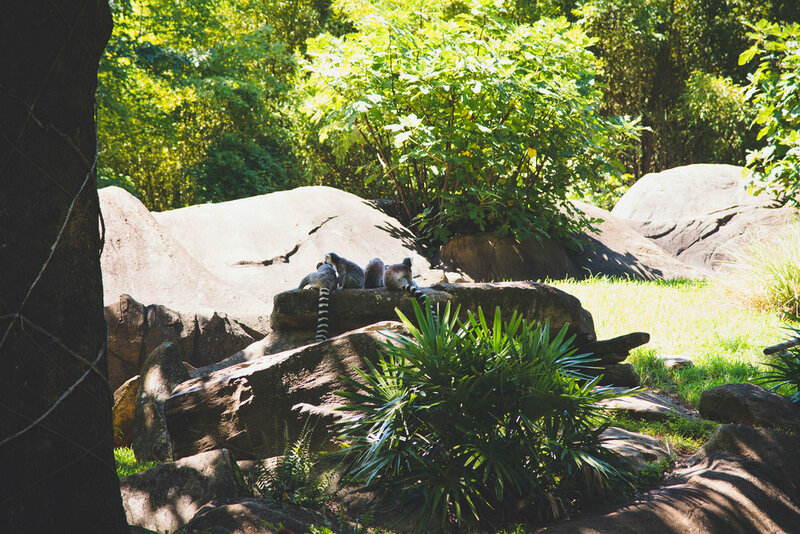 We saw giraffes, zebras, lemurs, lions, gorillas, and more! My kids fought over their camera, they held hands with each other and their cousins, they laughed, someone probably got upset over something and cried (with five children in our group, it's bound to happen, right?!? ), they played and overall, we had a blast! Take a look at some images from our day. Oh, and look - I was there, too! 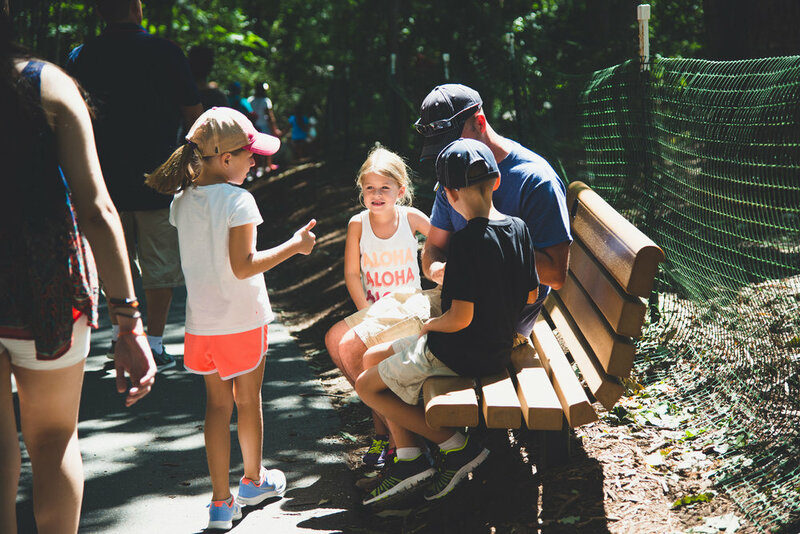 Does your family love to visit the NC Zoo? It would be perfect for a "Fall Outing" session (see blog post HERE) with Laura Ann Photography. Contact Laura today to schedule yours. Take a look at some of my fellow photographer's work by following the blog circle. Laurie Schultz has posted about her favorite summer moments HERE.